In ancient Egypt there was a city called Per-Medjed, which was the capital of the 19th Upper Egyptian Nome. After the conquest of Egypt by Alexander the Great in 332 BC, the city was reestablished as a Greek town, called Oxyrhynchou Polis (“town of the sharp-snouted fish”). In Hellenistic times, Oxyrhynchus was 3rd largest city in Egypt. Outside the city was a series of garbage dump sites, at which the inhabitants of Oxyrhynchus would dump their garbage. They dumped their garbage there for more than 1,000 years. The Sophia of Jesus Christ (POxy 1081). Irenaeus (P405 = 3rd century). There are many parts of other canonical books as well as many early Christian hymns, prayers, and letters also found. Grenfell and Hunt discovered the first NT papyrus (P1) on the second day of excavation in the winter of 1896–7. The focus of the project is now mainly on the publication of this vast archive of material. As of 2007, 4,700 items had been translated, edited, and published in 72 volumes. Publication continues at the rate of about one new volume each year. Approximately 40 more volumes are expected. 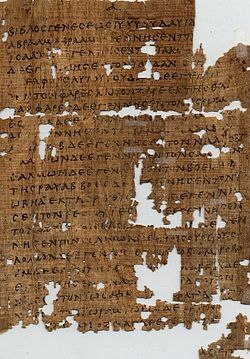 The Oxyrhynchus papyrus fragments have greatly increased our knowledge of the state of the NT text within centuries of its composition.